A few weeks ago, my wife, Jessica, and I were attending a local weekend arts and crafts fair at one of the smaller towns in Western Texas. On any given weekend there are likely to be 5 or 6 such events going on, wherein vendors large and small hawk their clothes, arts, crafts, music, and other things. At one such booth I came upon an old man hawking a series of western novels he wrote and self-published. Having been taken with the words and works of San Angelo writing legend Elmer Kelton, some years back, I was hoping that perhaps I might discover a diamond in the rough, so to speak. After almost ten minutes of gabbing, I felt almost obliged to buy one of his books, which all sold for $15 each. This was especially so when I mentioned Kelton’s name, and my surprise and enjoyment at having discovered that his best work well exceeded the literary hackwork of lauded MFA writers like Dave Eggers, David Foster Wallace, Thomas Pynchon, and the like. I thus asked him which of the 6 or 7 titles he had on sale was the best of his books. The man paused, then said, ‘Well, it’s hard to say, as they’re all my babies,’ and after talking of a trilogy of books based on one character, Mitt Stone, he pointed to his two latest novels, Concho and Phantom Herd, his very latest book. But, after pressing him, and saying I only wanted one book, and his best, he offered me up Concho to read. According to the man, whose name is Denzel Holmes (www.denzelholmes.com/), a retiree who turned to writing in his golden years, Concho was the best because he had gotten better over the years with characterization and other elements of writing. Thus, it was Concho I purchased. Having been to San Angelo, Texas, where Kelton was from, and knowing a bit of that area, situated on the Concho River, I figured this book would be easier to follow geographically. It was. Unfortunately, the 371 page, approximately 115-120,000 word book, is, overall, not that good. As someone who has championed the works of self-published and indy authors before, such as Eddie Stimpson, Jr.’s My Remembers and Elliot Rais’s Stealing The Borders, as well that of Kelton, this was a disappointment. But, fair is fair, and good criticism is good criticism, so excelsior! The main antagonists of the tale are a bullish real historical figure named Colonel Ranald Mackenzie, and a far too stereo typical Mexican bandito named Railo. While the first half of the book does a solid to good job of setting up the tale, its best moments are in developing the minor characters in Altmann’s clan and Guthrie’s employees. By contrast, Mackenzie has no real life outside that of a typical military man, and Railo seems to be a fifth rate version of the bandito characters that New York born Jew, Eli Wallach, used to essay in westerns such as The Magnificent Seven and The Good, The Bad, And The Ugly. Now, before I get to the second half of the book, let me admit that when I review films and books I tend not to give a damn about revealing the ends of these works, as real criticism must take on works in their entirety. The very concept of ‘spoilers’ is a product of this Lowest Common Denominator intellectual and artistic culture we are drowning in. Hence, I will reveal the errors that doom the second half of the book to be significantly worse than the first half. If I’d grade the first half of Concho to be a good, solid and readable 70 to 75 out of 100, the second half barely reaches 50, and it’s a stretch of generosity on my part to claim the whole book should be seen as a barely passable novel that grades out at 65 of 100. Given that Holmes claimed this was his best book, I really have no interest in exploring the further bounds of his diegetic universe. But, on to the second half. I won’t get specific, but merely state that everything one could expect to happen, given the narrative and character thrusts I’ve mentioned, indeed does happen, exactly as expected. Altmann gets his dam built, Bob Guthrie finds true love, Railo gets his comeuppance in predictable Western style, and Mackenzie, well, he’s just there as a historical prop. Yes, there are Comanches and battles with them and Railo’s banditos, but one of the biggest wastes of time and narrative comes in an utterly pointless and way, way, way too long (dare I refrain from interminable?) digression that follows the thieving and recovery of some of Guthrie’s horses that ostensibly opens up other digressions, except that not a one of these digressions advances characterization, nor rises above mere plot contrivance. Concho is therefore not a literary novel in any sense, just a generic Western that could have been a bit more had its second half not fallen apart so terribly. Note the nonchalant start. This sort of opening to a chapter, and especially a novel, can work, if the rest of the novel’s peripheral tools are top notch, if there is depth and poesy lurking in the interstices between the seeming prosaic nature of the narrative, but in this case, the in medias res start is merely typical of the hum-drumness that follows. Now, let’s examine the dialogue. While not laden with clichés, there is no depth to these conversations. BY that, I mean the characters, here and throughout, show no introspection- not even offhandedly; meaning that we, as readers, can see depths in these characters that they do not even recognize. There is also no individuation of the characters in temperament. If one is to open a novel so prosaically, it should be at a moment where the characters are in some sort of dialogue between themselves that exhibits a tension. There is none here, and, furthermore, the attempt at a West Texas accent, even a 21st Century one, is hit and miss; much less if one wants to return to that of the late 19th Century. Pow! Pow-whomp! is literally the best description the book likely has of any moment or thing within. 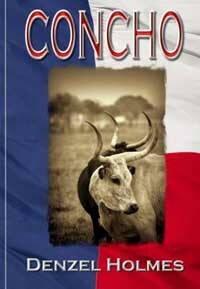 In sum, Concho is not a good book, but not a terrible one. At best, one might argue it rises above mediocrity due to some good early characterizations, slowly built up, but this is a fictive world where everything is surface level, the characters never question the shimmer of the desert, nor the sounds of the winds. Predictable things eventually evidence themselves, and the immediate question a good critic would have to ask of any tale put up before him has to be, why am I being told this? What benefits does it avail me of? And, a fair answer, in regards to Concho is a cowpokerly shrug of the shoulders.